LG TWINWash System with SideKick for Family Size Needs. LG’s new TWINWash is an appliance that the whole family is going to love. Mom and dad will especially love it because it allows them to two loads of clothes in half the time. As the name implies, LG’s latest front loading washer allows you to wash two loads of laundry at the same time, making it somewhat revolutionary. I don’t have to tell you how much laundry you need to do in your home, just like I don’t have to tell you how much easier life could be if you were able to do two loads at once. You already love the idea and so do I. What this does is give you a bit of freedom back from your chores. The LG TWINWash with SideKick is all about efficiency. Two Loads at a Time. You get your clothes cleaner in less time. Because we all have something better to do with that time. 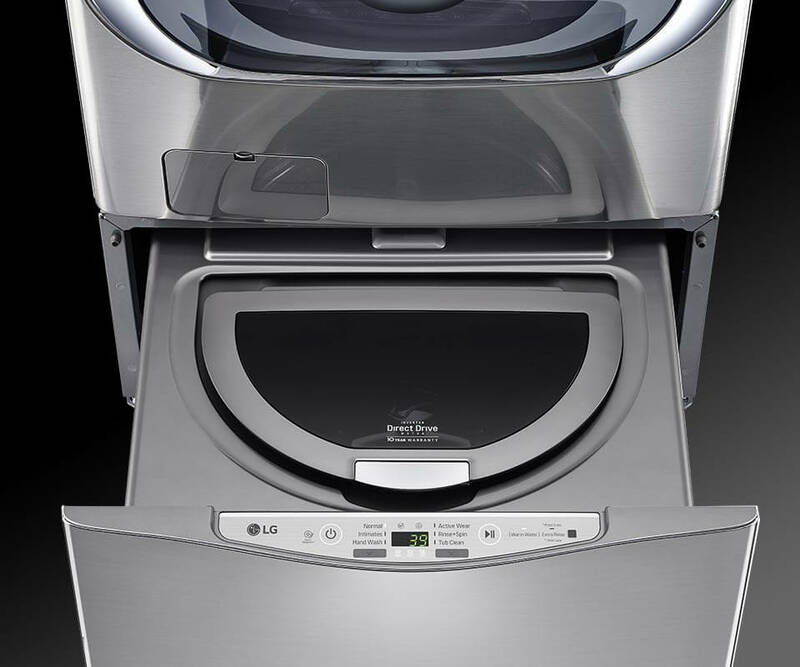 You can put a big load in the front-loading washer on top, while the smaller LG SideKick unit simultaneously washes a second load down below. That second washer not only comes in handy for saving you time, but it also raises your front-loading washer’s height. The concealed control panel matches the pedestal beneath the dryer too. The door of the main washer is aligned with the drum’s center, positioned higher than on conventional models and tilted at an angle to make loading and unloading easier than ever before. This is another great example of an LG product that truly succeeds in making life better for consumers. Aside from the already mentioned benefits of saving time, LG’s new TWINWash also brings with it a significant reduction in washing time. The TurboWash feature saves up to 30 minutes on larger loads without sacrificing cleaning performance, while LG’s steam technology gently cleans, extending the life of your clothes. The nozzles inside of the drum of the main washer spray a concentrated solution of detergent directly onto the clothes, improving cleaning performance, while another high pressure nozzle sprays tiny water particles through the clothes during high spin cycles for more effective rinsing. The main washer is available in 21kg capacity, while the LG SideKick can be set to run a different wash cycle with a smaller load. The LG SideKick weighs only 3.5kg and is perfect for delicate or specialized items like baby clothes and lingerie for instance. It also comes with an Energy Monitoring feature that gives you helpful data while LG’s HomeChat service is available in the 21kg system allowing you to physically text your washing machine to check the status or even start-up the cycle. This allows you to do laundry on your terms. There’s a lot to love about the LG TwinWash, but my favorite feature is the main event. The ability to run two loads at once is what just about every household needs. It frees up your time, gets the job done faster and generally makes me ecstatic. I think most busy moms and dads would agree. 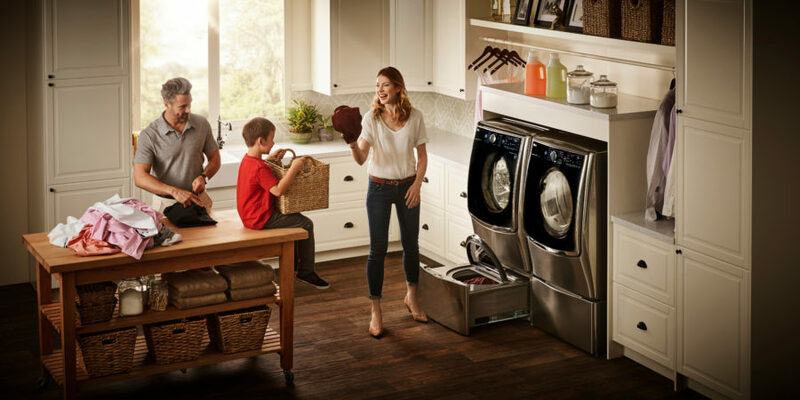 From 1/11/18-4/25/18 receive up to $500 off a LG laundry solution for your home. Get your LG TwinWash System at Best Buy. I have been compensated in the form of a Best Buy Gift Card and/or received the product/service at a reduced price or for free. For more information, Check the Review Policy.